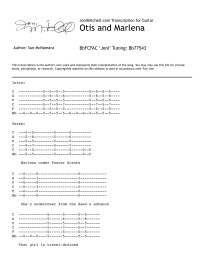 Thanks to Howard Wright and Jim Leahy for their help on these chords. This transcription is the author's own work and represents their interpretation of the song. You may only use this file for private study, scholarship, or research. Copyrighted material contained in transcriptions is used in accordance with 'Fair Use'.